1 of 5 Whisk together olive oil, vinegar, sun-dried tomatoes, garlic, 1/4 teaspoon of the salt and 1/8 teaspoon of the black pepper. 2 of 5 Place pork and 2 tablespoons of the oil and vinegar mixture in a resealable plastic bag. Shake to coat pork, and refrigerate 2 to 4 hours. 3 of 5 Place potatoes in a medium saucepan and cover with water. Bring to boiling and simmer 10 minutes; drain. 4 of 5 Heat a gas grill to medium-high or the coals in a charcoal grill to medium-hot. 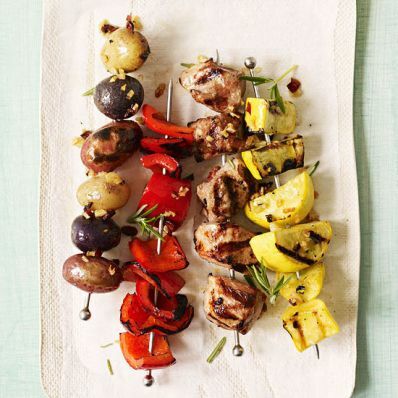 Thread pork onto 2 skewers, potatoes onto 2 skewers and vegetables onto separate skewers. Brush generously with oil and vinegar mixture. 5 of 5 Lightly coat grill rack with oil or nonstick cooking spray. Grill vegetables 5 to 6 minutes and potatoes about 4 minutes, turning a few times and brushing with oil and vinegar mixture. Grill pork 3 to 4 minutes per side or until internal temperature reaches 145 degrees. Brush with remaining oil and vinegar mixture. Sprinkle remaining 1/2 teaspoon salt and 1/8 teaspoon pepper over skewers before serving. Per Serving: 4 g sat. fat, 29 g pro., 21 g carb., 16 g Fat, total, 62 mg chol., 493 mg sodium, 5 g fiber, 355 kcal cal.